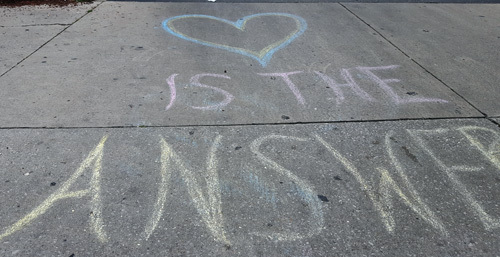 It started with Alchemia Art of Hair, who invited the public to write messages of pride, love, and support on the sidewalk outside the shop at 5009 N Sheridan. Now the trend has moved slightly north, with the wall and sidewalk at 5050 N Sheridan full of messages proclaiming love. We don't know who's behind this one, but we support it whole-heartedly.